I was was late to my first period class, rushing by an open classroom that had an off period when I saw a few teachers and students crowded around the TV, so I stopped. As I walked in, hands moved to cover open mouths and sad eyes. It was hard to understand what we were watching, but I knew everything had been changed. 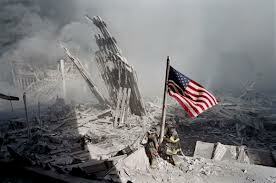 12 years later and our lives are still intertwined into events of that day. We are blessed to live in a strong nation; one full of men and woman committed to keeping our soil for free feet and safe souls. I'm so grateful for that. Today, my thoughts are with the moms, sisters, brothers, daughters, sons, fathers, wives, and husbands who's heart's still ache from the loss of that day. Love this. Thanks for taking the time to reflect.